17th/18th c, pine, natural mineral colors. 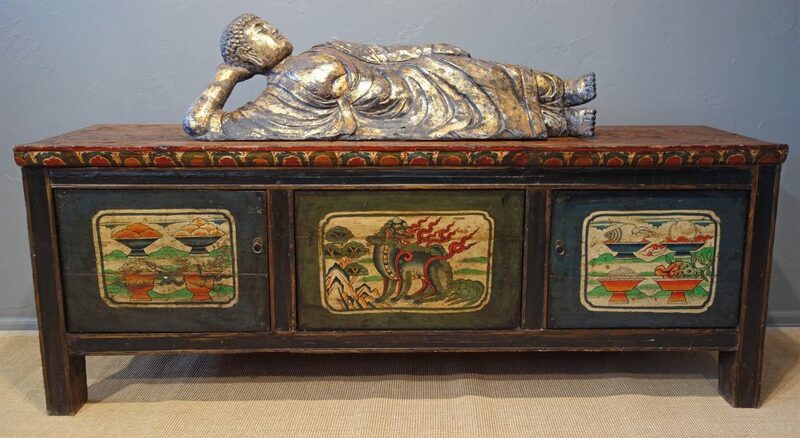 Tibetan low tables and chests have a long history, dating stylistically to the 15th century. These low furniture is commonly known to be developed in Buddhist Central Asia and transmitted to Tibet from Silk Road sites. Wherever their beginning, those that survived are now quite rare. In Tibet, the general population lived a nomadic life in tents. Low tables and chests painted with Buddhist auspicious symbols were used in a monastery, in the private home of lamas or that of persons of high religious standing. Inside monastic halls and chambers, monks generally sat on relatively high cushions and benches. This kind of chest was used to store books and items related to religious observance. On the top, an incense burner, a yak-butter lamp, and a dorje (an object with thunderbolt motif, which is a religious symbol representing the indestructible state of enlightenment) would be placed and the surface would provide a place from which to read the Tibetan wood-covered religious books, an important activity in Tibetan religious life. There are three door panels to the interior. The center panel depicts a fire-breathing dragon. Dragons are usually associated with wealth and status but on Tibetan furniture, dragons are frequently portrayed guarding the flaming jewels or the wheel of the Dharma (teaching of the Buddha). The other panels have paintings of bowls of offerings to deities. Below the top plank is a painted border of lotus petals, signifying purity of thought. The table-top bears incense burn-marks and the side panels indicate some soot damage, evidence of actual use in Tibet. Original Tibetan antique furniture is rare and valuable today because so many were destroyed during the Chinese Cultural Revolution and because later Tibet banned any antique furniture, especially of religious significance, from leaving the country. An authentic relic like this is a treasure to collect.